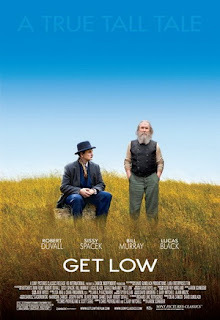 I look at "Get Low" as the third in the Robert Duvall Christian trilogy (starting with "Tender Mercies," followed by "The Apostle") and like other third films in the tradition of great movie trilogies (The Godfathers, original Star Wars, and Back to the Futures), this one is a step down. But it is still a very good film, and it gives us not just one, not just two, but maybe, if you stretch things, three churches to examine. Robert Duvall stars in this "based on a true story" film of a man who wants to attend his own funeral. Set in Tennessee in the 1930's, a hermit, Felix Bush, wants to have a "funeral party," but unlike Huck and Tom, everyone knows Bush is alive. He's a man of mystery who has been the focus of scurrilous stories for decades. And he says he wants a time when his story can be told. Felix first enters a church to consult a local minister with what is described as a "big, greasy ball of money" and asks if the pastor's heard the stories about him. The pastor says "Gossip is the devil's radio," and he claims he doesn't listen. The Reverend Gus Horton (played by Gerald McRaney of "Simon and Simon" -- I believe he played Simon) tells Felix if he's looking to buy forgiveness, he's in the wrong place. Forgiveness is free; he just needs to ask for it. This is a church I would consider attending based on the words and deeds of the pastor. 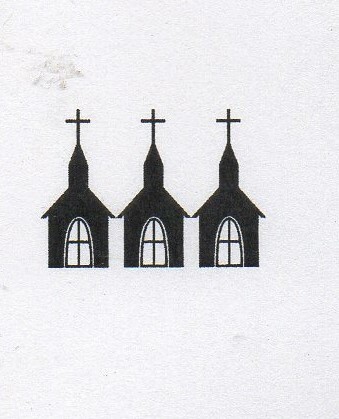 He's unwilling to be bought, though it is obviously a church struggling financially in a poor community. And he presents the gospel clearly. Though the local church is not willing to oblige Felix for cash, the local funeral home, run by Frank Quinn (Bill Murray), is more than willing to do so. Quinn sends his assistant, Buddy (Lucas Black), to go with Felix to see an old pastoral friend in Illinois to see if he'll speak at the service. But the Reverend Charlie Jackson (Bill Cobbs) isn't willing to bend to Felix's whims either. He asks Felix whether he has confessed to God, to the law, and those he's harmed. Felix tells him he hasn't been looking for forgiveness, that he built himself a prison he's been living in for decades. I might consider at least visiting Jackson's church in Illinois. The building itself is a beautiful wooden structure that was built years before by Felix Bush. So the funeral service takes place on Felix's property in the woods. Though not a church, true worship takes place at this service when true repentance finally takes place as well. I've always liked outdoor services. There is one more funeral service at the end of the film. Both Reverends Horton and Jackson attend. It's probably worth noting that Jackson, who preaches at this service, is African American, but no mention of this is made. In that time and place, this says something very good about all the churches involved, earning them 3 steeples.